Kimchi: I had a really good experience here because I was in good company, I was really happy with the food, and the waitresses were absolutely sweet ladies. Dinner all-you-can-eat here was $13.50, which came with refillable pocket pastries, refillable rice, refillable soup, 1 baby egg roll, and 2 rangoons. The decor could definitely use a remodeling, but hey, I didn’t come here to look at pretty walls. Plus, this place seems to have been running for a long time – you know that’s a good sign. My table & utensils are clean, so I’m happy. The food is laid out in buffet style (frozen meat…brisket cuts? a good amount of veggies, and sauces…including a lot of stuff on the floor of the buffet from people including me dropping the ingredients, lol) where you grab a bowl, and put in what you want to eat before handing it off to the cooks, who will cook it on a huge hot plate and do a funny dance-like circle around the griddle. All of the sauces, sesame seeds, and hot sauce are what make your bowl so flavorful and yummy so don’t skip out on those! (Although only put in however much oil you prefer, otherwise it’s your fault for being too oily :P) The warm, crispy yet soft pocket pastries taste SO good stuffed with your meat & veggies. More tips: water refill’s free but soda refills aren’t and I think they did charge us $1 for the water. Ingredients shrink down a lot (I mean, they’re veggies & the frozen meat is curled up) so pile it up like I did in mine unless you’re going to go for a lot of rounds 🙂 They also split up the bill for each individual person (8 of us) in our party so that was super convenient! 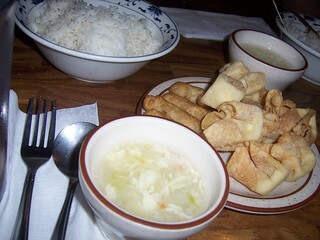 Kimchi: The egg drop soup was probably their weakest dish, but the baby egg rolls and rangoons were good. Many foodies reviewing this place seem to dislike these little side snacks the most, but if you know what to expect I don’t see anything to be disappointed about. The eggrolls are called “baby” for a reason and the rangoons do not have a trace of crab in them. These items were not what I came here for though, so unless you ordered the expensive a la carte of these things (…don’t do that), there’s nothing to be upset about here. Ladies bathroom was horrifying!!! My friend and I walked in, did a double take, and walked right back out. One toilet had no stall door – okay, that’s fine, there’s another stall. Well that stall seemed to be backed up with poo (great sight after a full meal) or the person before just didn’t have the courtesy to flush. GAG. I don’t know whether or not I should give this place the benefit of the doubt & just blame it on the customer, but maybe they should install another door and check in on the bathroom once in a while. 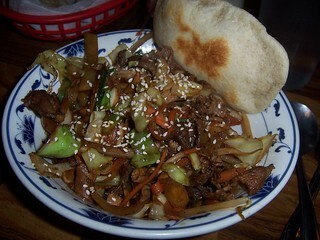 In my opinion, besides the great food, the Asian ladies made this old, run-down place shine. They were very silly and jovial – perhaps it was also the fact that they thought our group of 8 was full of high schoolers at first? (We are all 20-23 year olds, btw haha) They came to us very frequently (perfect on time actually) with more refillable items and joked around with us with smiles on their faces. Sweet ladies. As you can tell, I have no problems coming back again. Just don’t go into the bathroom if you’re a lady. Welcome to Happiness on a Plate, a food blog 🙂 Follow me (Kimchi) on my food excursions (Usually based in Orange County, CA) and my cooking adventures!